Altitude: Around 3600 metres above sea level. Habitat: It is found in high, dry, rocky grasslands in valleys and rocky slopes of the Andes in fully exposed sites. Inhabitants must be very rugged in order to tolerate such extremes in exposure. Rebutia tafnaensis is such a robust individual. 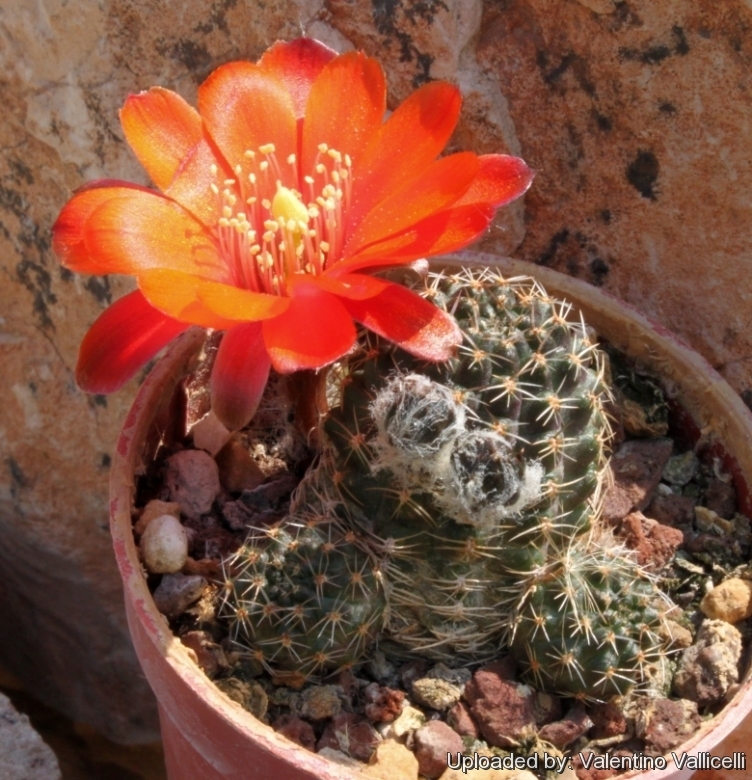 Description: Rebutia tropaeolipicta is one of the many geographical variety (forms?) of the extremely variable Rebutia pygmaea. It has bright orange-red flowers. Habit: It is a small geophyte cactus, with a heavy tap root that may exceed the size of the plant above soil level. Solitary or clustering and barely rising above ground level. Roots: Tap root more or less branched whitish. Stem: about 10-30( mm tall, 12-20 mm wide, spherical to slightly oblong, becoming short-cylindrical in cultivation. Areoles: Oval, with abundant white or light brown felt, a little far apart. Radial spines: about 8-11, thin, bristly, pectinate, short, whitish with a darker base, 2-3 (pr more) mm long. Flowers: From the basal parts of the stem, widely funnel-shaped usually orange-red. Blooming season: Flowers all tend to come in one late Spring rush, rather than spread over the Summer. Cultivation and Propagation: Rebutia tropaeolipicta is a summer grower species that is easy to cultivate and recommended for beginners. The whole Rebutia pygmaea complex has delightful flowers and the plants remain compact, and clumps can easily be managed by division. Another advantage is that the plants are very cold hardy in Winter if kept dry.